Life has been quite hectic around here lately. I’m sure you know what I mean, we get caught up in the whirlwind of time and soon enough it’s been entirely too long since our last post. I often find myself missing this little nook in the world-wide web and sharing all that’s delicious and healthy with you, Golubka’s lovely readers. This time it’s a simple savoury meal, one that we find ourselves coming back to this winter due to its satisfying, earthy flavours. Falafel and tabouleh. My love affair with falafel started years ago, when my Middle Eastern cuisine loving husband took me out for a falafel pocket with tabouleh, hot peppers and yogurt sauce. I was, of course, hooked. Since then I’ve made my own falafel the traditional way and, more recently, this much healthier and very delicious version. As for Paloma, she is often the first one to wipe her plate clean, busily switching between eating with a fork, spoon, and her hands. We often have to remind her to chew her food. She takes after her parents. We’ll be back with more elaborate meals soon, as well as a few stories. But for now, I hope you enjoy this flavourful meal and have a tranquil weekend. Mix together the mushrooms, carrots, onion, garlic, 2 tablespoons of olive oil, and a pinch of salt. Spread on Teflex-lined dehydrator trays and dehydrate at 115F for 1 hour. After dehydration, pulse the mixture in a food processor to achieve small pieces. Transfer to a large bowl and set aside. In a food processor, grind the nuts and sunflower seeds to a crumbly texture. Add the ground nuts, parsley, cumin and lemon juice to the mushroom-vegetable mixture and mix thoroughly, seasoning with salt and pepper. Form into spheres, and roll each one in a mix of ground flaxseeds and sesame seeds. Dehydrate on a screen-lined tray for 2 hours before serving. Whir the cauliflower in a food processor until finely chopped. Take care to not over-chop it to preserve the crunchy texture. Toss with the remaining ingredients in a large mixing bowl. 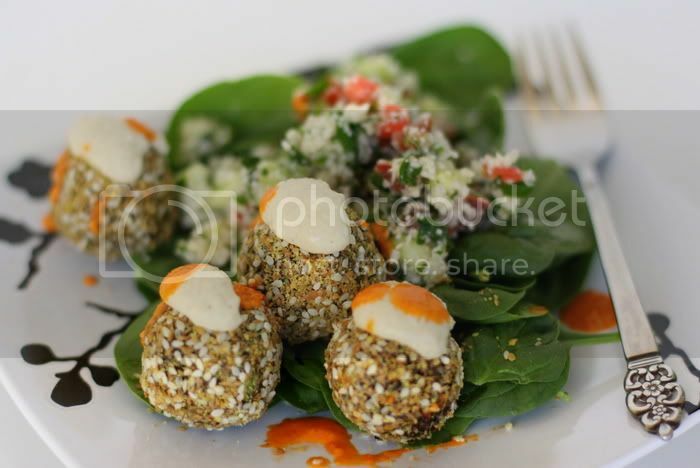 Serve on romaine lettuce or baby spinach leaves with the falafel and sauces. Coat the red pepper in 1 teaspoon of the olive oil and dehydrate for an hour. In a high speed blender, blend the pepper with all the remaining ingredients until smooth. As always beautiful pictures and recipes! Wishing you all the best. so nice, so savory. i love the 2 sauces together too – what a nice recipe for the weekend. yum and thanks! looks great. I can’t wait to try it out. you have such a gift of styling – I can only hope mine turns out half as beautiful! Wow, great looking mid east cuisine! I can taste and smell this dish thanks to the wonderfully vivid pix. Who’s the cutie on the couch? Glad to see you’re back at it. I think I can do it!!!! I’ll let you know! The few years that I lived in Chicago I survived on both of these–not the raw versions of course. So you can imagine my delight, I get to make two of my favorite things RAW!!! Thanks so much for posting such wonderful recipes. i am so excited that you posted this! falafels and tabouleh are two of the greatest foods ever! i’ll definitely have to try this recipe. also i’m glad that you don’t have chick peas in your falafel recipe because i can’t eat those. love your blog! I can’t wait to try your ‘version’- it looks so much more delish than mine! Thx 4 sharing! 1. How many falafels does this make, and what size did you make them? 2. And what amount of sauce and tabouleh do the recipes make? Thanks so much, would like to make these for a get together with friends but need to estimate how much I need to buy at the store :) They look SCRUMPTIOUS!!! Thanks very much, everyone! All the best to you. Sn, the recipe says it serves 6-8. It makes a pretty large bowl of tabouleh. 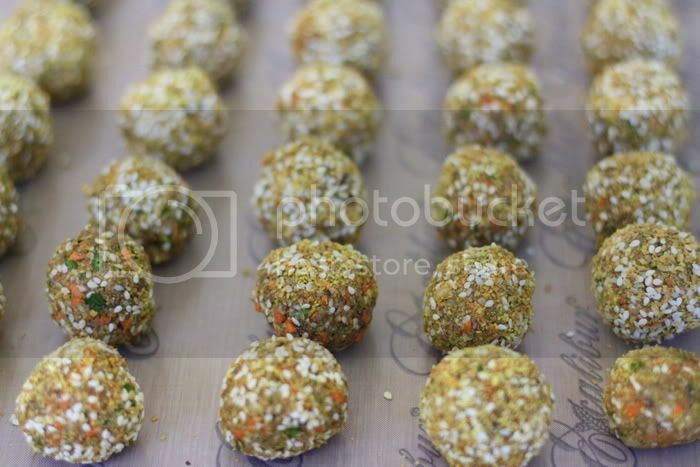 If you make the falafel about 1 inch in diameter, you should end up with around 48 falafel balls. The amount of sauce is pretty proportionate to the rest. Hope that helps. Every post on your blog feels like a gift to the world. Thank you for always inspiring me with the beauty and love you share here. Such pretty falafels! I have a great recipe, but mine always turn out to dark and ugly (ha). With yours though, that isn’t the case – I love seeing the separation of colors and how the white sesame seeds adds an overall lightness – Lovely!! This looks soooo delish- any thoughts about swapping out the mushroom with say zucchini since I’m not a mushroom girl? or eggplant? 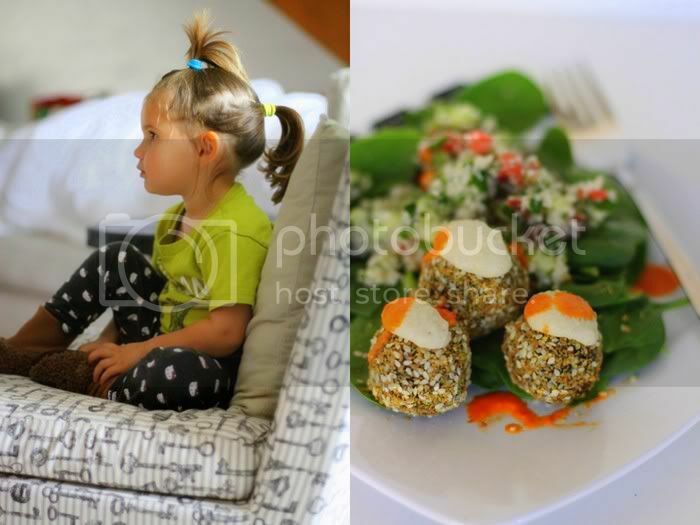 Thanx for sharing, I love falafel too and would love to make this recipe work! I’ve been looking around for falafel and tabouleh recipes. I’ve got my zucchini hummus and baba ganouj down, so I think a Middle Eastern Feast is going to happen soon! Thanks Golubka. Oh, my goodness, what a beautiful blog! What is your secret for those gorgeous photographs? If leaving out the sunflower seeds (allergies) – would this quantity need to be subbed with another nut/seed to keep consistency or can it simply be omitted? Also, the last falafel step – “Dehydrate on a screen-lined tray for 2 hours before serving.” – does this require a dehydrator or can this step be done in an oven and at what temp? Can it be done on a sheet pan or does it need a screen-lined pan? This recipe looks great and I’d love to try it! Sorry for the numerous questions; the only thing I’ve ever dehydrated is fruit using a conventional oven + regular sheet pan. Thanks!